Festuca temulenta (L.) Columbus & J.P. Sm. Habit: Annual. Stem: ascending to erect, 4--9 dm, glabrous to scabrous. Leaf: ligule < 2 mm; blade 5--20 cm, 2--7 mm wide, folded in bud. Inflorescence: 7--28 cm, spike-like. Spikelet: (15)20--30 mm; glume >= rest of spikelet except awns, 10--17(20) mm, lanceolate to oblong; lemma 5--8 mm, awnless or awned at tip, awn 8--18 mm. Chromosomes: 2n=14. Unabridged Note: Toxins produced by internal fungi, ingested via contaminated grains can cause central nervous system disturbance in humans, gastrointestinal and motor difficulties ("grass staggers") in animals. Plants assignable to Lolium temulentum subsp. remotum (Schrank) A. Löve & D. Löve reported from California but records lacking. 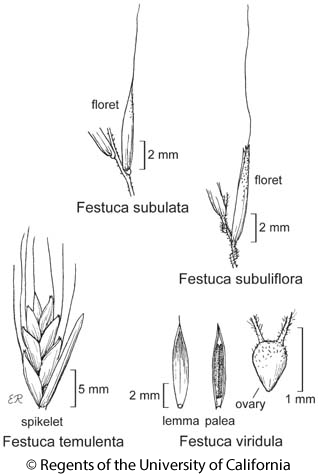 Citation for this treatment: James P. Smith, Jr. & Susan G. Aiken 2012, Festuca temulenta, in Jepson Flora Project (eds.) Jepson eFlora, http://ucjeps.berkeley.edu/eflora/eflora_display.php?tid=93753, accessed on April 19, 2019. No expert verified images found for Festuca temulenta. CA (exc SNE); Markers link to CCH specimen records. Yellow markers indicate records that may provide evidence for eFlora range revision or may have georeferencing or identification issues. Purple markers indicate specimens collected from a garden, greenhouse, or other non-wild location.